Owner John Peterson inside the soon-to-open The Rice Box storefront in The Heights. After 18 months of development, The Rice Box, which started as a food truck, is about to have a street level brick-and-mortar location. It is slated to “soft open” on Chinese New Year, which is on Saturday, January 28. 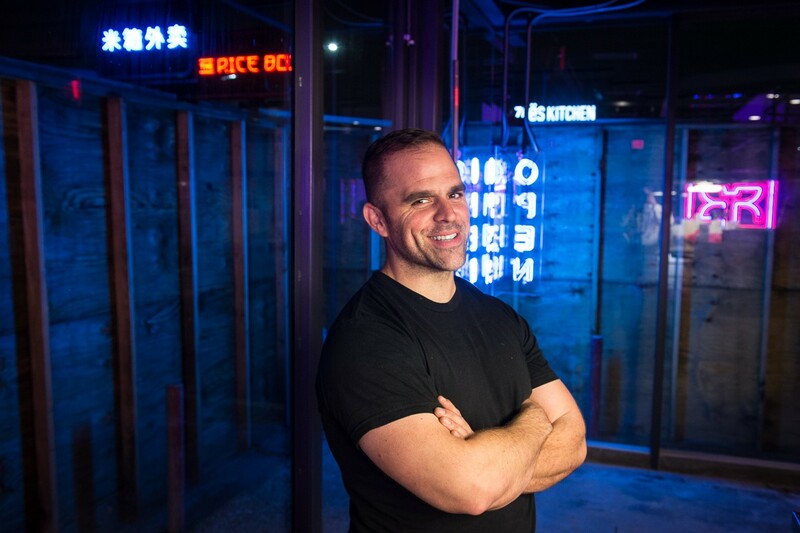 Owner John Peterson’s first expansion of the truck’s Chinese-American style food was at a counter-service spot in the food court of 5 Greenway Plaza (where it exists alongside Greenway Coffee and Kuma Burgers—other notables in the unlikely location). Peterson says that the menu of the new storefront, located at 300 West 20th in The Heights, is modeled after the Greenway location. The features include General Tso Chicken, Sesame Chicken, Mongolian Beef and top notch crispy fried dumplings. On a bittersweet note: “hello” to the new restaurant means “goodbye” to the food truck. This Saturday will be the last night the familiar, bright red Rice Box truck will take up its familiar station across the street from Poison Girl bar on Westheimer. After that, it will be kept for catering gigs. It will always be known as one of the true survivors of the gourmet food truck trend that took hold in Houston six years ago and then dwindled a few years later. Peterson started The Rice Box in 2011; it has been here for the duration. Much like the truck, though, the Heights location is geared heavily for take-out. There’s no formal dining room, although there will be nine barstools along the counter and rather spacious patio seating outside. “How many places in the city of Houston do you know of where you can sit at a bar and eat Chinese? I just want to go in for 15 minutes and get an elevated tea and have some Chinese food,” pointed out Peterson. The streamlined space will guide patrons from the magnetic menu board to the order/payment station, then down to the taps. 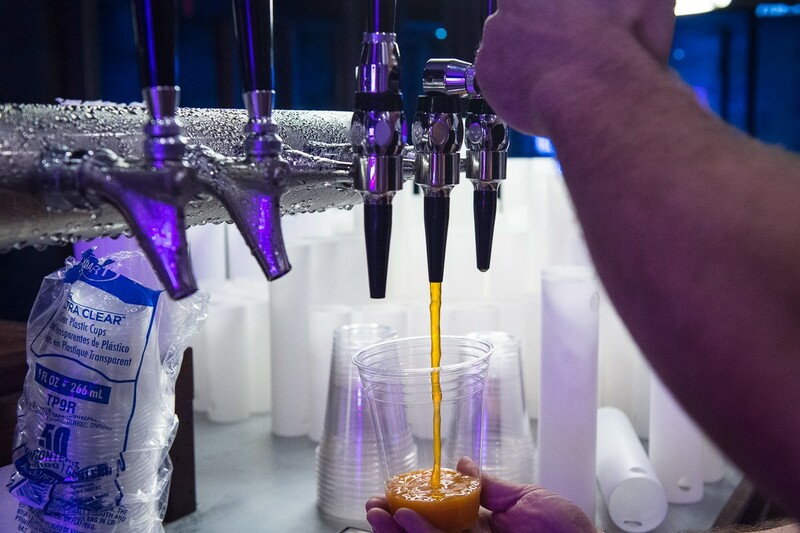 That’s where visitors will find that “elevated tea.” The tap system has five beers on draft as well as some eye-opening “nitro tea” in Thai, black and green varieties. The mixing of the pressurized nitrogen gas with the tea creates tiny, cascading bubbles as it is released from the tap. That lends creamy texture—no added dairy required. The Thai tea especially benefits from the process. Instead of a heavy, dessert-like feel, it is closer to ethereal, with all the expected seductive, spiced fragrance and flavors. 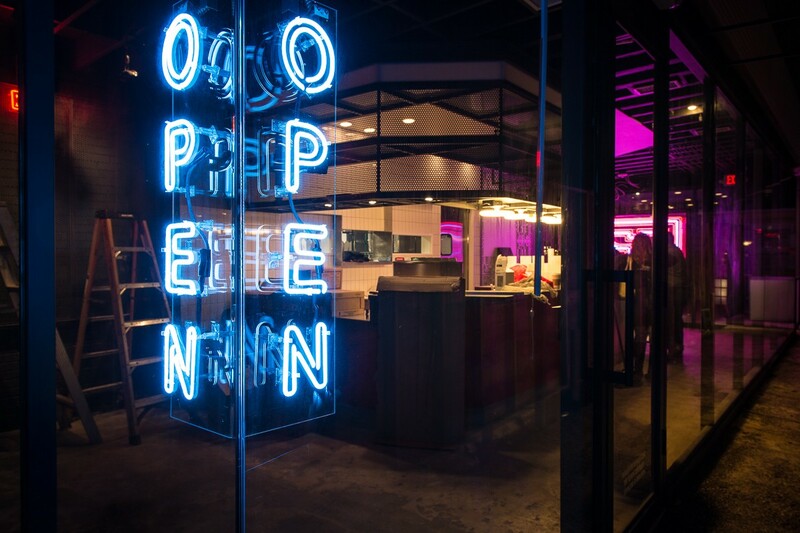 Inside the streamlined glass space is an enormous, triple-tubed red and blue neon The Rice Box logo. The windows on the opposite sides reflect the glowing visage. Outside, another neon sign, with the restaurant name in both Chinese and English, beckons in visitors. Yet, with all the modern trappings, Peterson’s goal is very simple. “I grew up on mounds of General Tso’s chicken. When I started The Rice Box food truck, I said, ‘I want to have the best General Tso’s chicken.’ That’s what I want to have. I am super, super passionate for bringing this style of take-out to people. It’s very coherent with fast-paced, take-out culture. For fans of this style of Chinese food, the welcoming glow of The Rice Box sign is likely to set up an instant hankering.